And this is אֲדנָי יֱהוִֹה as it appears in Zeph 7:1. Excellent stuff, Jameson (will we be expecting an update to "Jehovah Rants" sometime soon? ). Of the 11 instances where the Aleppo Codex has אֲדֹנָי, are they located in any specific book, or dotted around? Is there anything in the verses that could explain why only these 11 places have אֲדֹנָי? Will you be checking all these places on the Leningrad Codex as well (which I believe is a bit harder to find images of - https://archive.org/details/Leningrad_Codex)? I mean www.tanach.us has the Leningrad Codex in HTML form; but I prefer checking images rather than someone else's transcription (which could be wrong). In the Yemini( original) pronunciation אֲדֹנָי and אֲדנָי sound virtually identical . LOL - Keep it up. Five of the eleven instances are on the same page of Psalms. I would surmise that that page was "corrected" to darken the ink, given that many pages of Psalms are highly faded. My guess is that the word received a cholam on the page as an attempt at clean-up and clarification of the text. That would bring us to six other instances. I don't see any pattern. It is random and unpredictable. I have a copy of the Leningrad Codex, but it's a PDF that doesn't save your browsing position or have any type of location index. I used aleppoxcodex.org for most of the text. There were four or five pages missing from the text, which I found manually on a PDF copy. It’s true.Don’t you know that ? Five of the eleven instances are on the same page of Psalms. I would surmise that that page was "corrected" to darken the ink, given that many pages of Psalms are highly faded. My guess is that the word received a cholam on the page as an attempt at clean-up and clarification of the text. Interesting. Certainly plausible as well, especially as removing these five leaves just six instances in the entirety of the Tanakh. That would bring us to six other instances. I don't see any pattern. It is random and unpredictable. I do know the guys in charge of www.tanach.us are really pedantic at making sure it is a perfect edition of an electronic Leningrad Codex, so that should be okay to check. Not quite sure how good their search function is on the website (if indeed it even has one). The specific instances in question are in bold. I've pulled the page that they are found, together with the previous and following pages, and I've highlighted all occurrences of יהוה and אדני יהוה in the text so that you can easily locate them to compare. You can find the PDF here. I looked at tanach.us, and it's an impressive site. It links to the actual folios of the Leningrad Codex, so it will certainly be useful to me in my investigations. Thanks for the link! By the way, looking at the Leningrad Codex of Ezekiel 28:24-25 reveals that there they leave off the cholam on יהוה even when it is pointed as אלהים. Interesting! That doesn't happen in the Aleppo Codex. Excellent stuff, Jameson. Glad the site recommendation will be of service! Seems to be that there's more than a few places where there's no cholam on יהוה in both the Aleppo/Leningrad Codices. Would take an awful long time to check all 6,828 places (think that's the number dotted around of total instances of יהוה); possibly just checking a chapter or two from each book, noting down the amount of יהוה's with or without the cholam, and than working out an average. Would be a decent start at any rate! I decided to go checking the Dead Sea Scrolls Biblical Manuscripts to see if I could a) find the 11 places intact; and b) see whether they had plene or defective forms in said places. Unfortunately, Jeremiah 44:26, Ezekiel 28:24, 28:25, 29:3, 29:8, 33:20 and Malachi 1:4 aren't extant in the Dead Sea Scrolls, so can't see what the text may've been in those places. As for Psalm 130:6, though technically the verse is extant in 4QPse/11QPsa, they are both fragmentary and neither have אדני extant. Thankfully for Isaiah, we have the Great Isaiah Scroll (1QIsaa), and it has all three verses from Isaiah in question extant. In 28:2 however, it has neither the defective אדני nor plene אדוני, but rather has יהוה in its place! 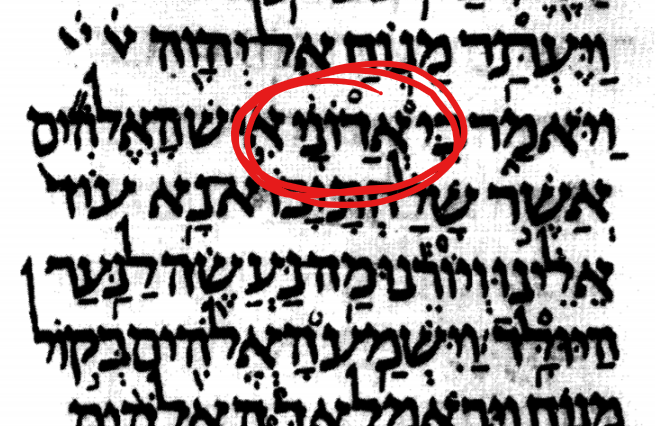 There is one instance of the form אדוני in the MT as a name of God. It is in Judges 13:8, as I mentioned above. This is that plene form in Judges 13:8. Last edited by Mod8; 02-06-19, 09:51 AM. The Leningrad Codex has the same plene form there.